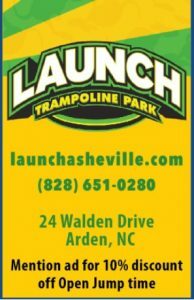 LAUNCH ASHEVILLE Trampoline Park ~ 10% Discount During Open Jump Time! Launch Trampoline Park is a 25,000 sq. ft. indoor sports and family entertainment facility in Arden, NC just 5 miles south of Asheville. With over 12,000 sq. feet of connected trampolines forming one GIANT jumping surface and angled trampoline walls to bounce off of, Launch will get your whole family off the couch and in the air in no time!